As industrial facilities continually look for ways to reduce capital costs and decrease installation timelines associated with water treatment and other systems, the practice of containerizing equipment has become more prevalent. A containerized system offers many benefits of lower costs than comparable field-erected buildings, faster timelines, and lower field installation requirements. However, once site building requirements, materials of construction, design life needs, and other specifications are considered, the total installed cost and total cost of ownership may not be as attractive as originally considered. A focused evaluation of needs and expectations of treatment equipment and building requirements can help to determine if a containerized treatment system is the best fit for the project. There are several container systems used in the marketplace today. The most commonly used is industry standard ISO shipping, containers. Available in lengths from 20’ to 53’, shipping containers are comparatively low cost, abundant, easy to transport, and rugged. The second most common style is a fabricated steel enclosure, built to specific project dimensions. Although they require longer lead times and are often two to three times more expensive than shipping containers, fabricated enclosures offer the conveniences of a field-erected building while still being shop-constructed. One of the most significant benefits of any containerized treatment system is the reduced site installation requirements. 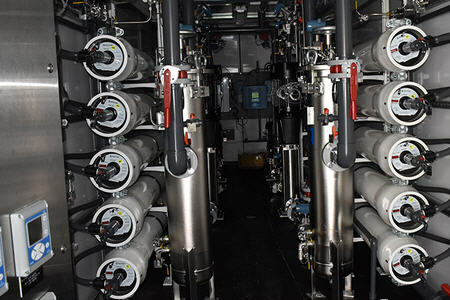 Container-based treatment systems arrive completely shop fabricated with all interconnecting piping, wiring, and testing complete before the system arrives to the jobsite. In many installations, the installing contractor needs to install a sufficiently rated concrete foundation, set the container, connect piping, and perform electrical terminations to one enclosure. Installation history has shown that from time of delivery to time of treated water being available can be within a matter of days. In the case of projects involving multiple containers, connecting from container to container can be minimized with effective coordination of the container manufacturer and the installing contractor. While the bare container cost may seem low, the added costs related to customization can quickly exceed the initial container cost, possibly increasing the cost above a traditional building installation. Larger treatment operations like clarifiers, dissolved air floatation (DAF), gravity filtration, and solids handling equipment may require stackable containers, removable walls, and other unique features. 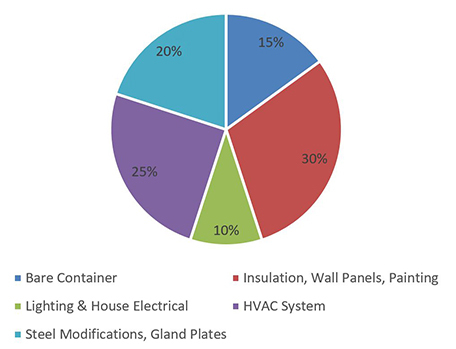 Additionally, items like wall paneling, insulation, lighting, electrical, and HVAC systems can add tens of thousands of dollars to a containerized system. State and county specific requirements must also be considered in some jurisdictions as fire detection, fire protection, seismic, and noise limitations may or may not be able to be maintained with a container-based system and may require a field-erected building. In one example, an east coast power plant was evaluating a containerized system compared to a field-erected system. In this instance, a containerized system consisting of three, 53-foot long shipping style containers had an associated capital cost of approximately $200,000 once all site requirements were established. With a total finished area of less than 1,300 square feet, this is a relatively high cost compared to a field-erected building. However, the containerized system could be designed and assembled in less time than a traditional building allowing site construction resources to be assigned to other projects during this time. In the end, the power plant elected to proceed with a container-based treatment system. As plant’s look beyond the initial installation costs and timelines, they often discover the greatest drawback to a containerized system — maintenance. While a traditional water treatment building allows for overhead piping racks, cable tray, buried piping, and standalone electrical equipment, space is the ultimate premium within a container. Simple maintenance activities like sensor calibration, filter replacement, and completing operator logs are usually easy to complete with proper equipment routing. Medium complexity activities such as RO membrane replacement, instrument replacement, or even filling chemical storage tanks can be difficult with the limited floor space. While replacing pumps and motors can be straightforward with an overhead lift or other means in a traditional building, their replacement in a containerized system can be very challenging. Often, unrelated piping, valves, and instruments must be removed to permit access to those items needing repair or replacement. One way to increase the ease of maintenance activities is to increase the number of containers, but, again, it becomes a balance between containerization costs and traditional building installation costs. Multiple industries have installed containerized water treatment systems in recent years, including power, food & beverage, data centers, and chemical production plants. As their use becomes more prevalent and design engineers increasingly request their use, particular attention must be paid to long-term operations and maintenance while balancing the construction costs and timelines of the project.